A fine conclusion to the trilogy. 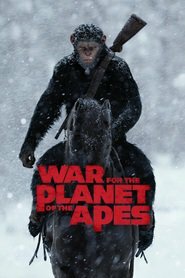 The apes are so authentic and there’s lots of drama and action. The story is interesting and it has important things to say about human identity. The set pieces are awesome but there are also some excellent, intimate moments that are very moving. The story always stays at the forefront of the film. I’m sorry to see this series end. Make sure you catch it on the big screen at a cinema. I think this trilogy is destined to be enduring. Some time, it will be worth going back and binge watching all three!